It is sometimes said that by failing to plan, a person is planning to fail. This is often the case when a person dies intestate and his estate is divided up without regard to what the person would have wanted. Making a will does not always have to be a complicated or even expensive undertaking, and therefore, most people are advised to ensure they have a will that represents how they wish their estate to be divided upon their death. A person is said to have died intestate if he dies without a valid will in place. In Florida, as in all other states in the country, if a person dies intestate, the law decides how a person’s property is to be divided, and who are to be the heirs. Florida law divides a deceased’s estate differently depending on whether or not the person has a spouse or children. If the person who dies without a will leaves a spouse but no children, the person’s entire estate is inherited by the spouse. If there are children left behind who are also the children of the surviving spouse, the spouse again receives the entire estate. In these scenarios, if the person dies without a will and is concerned about what will happen to his spouse, there is no problem. However, there may be a potential problem with the children’s inheritance. Let’s say the surviving spouse remarries after some time and then makes a will leaving her entire estate to her new husband. This would leave the children of the first marriage with no access to their father’s property or assets because their mother did not leave them anything after she took possession of the father’s estate. Note that the law has different protections for minor children, but adult children would effectively be disinherited by their mother, who is under no obligation to leave them anything under her will. This situation can be avoided by making a will that distributes property or assets to children, even through the use of a trust if the children are minors. Note that property that is jointly owned will likely go to joint owners upon death, and the proceeds of a life insurance policy will go to the named beneficiary. Therefore, a will may not generally affect these types of assets. The intestacy law’s provisions are different if the surviving spouse of a person who dies intestate is not the other biological or adoptive parent to the surviving children. In that case, the surviving spouse receives half the estate, while the children receive the other half to be split among them. If there is no surviving spouse and no surviving children, the deceased person’s estate is distributed to parents or siblings. 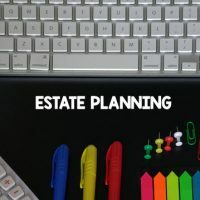 Making sure you have a solid estate plan that honors your wishes and leaves your loved ones secure after you pass away can start with a telephone call to an experienced attorney who can guide you through your options. For a consultation with the experienced estate planning attorneys, call the Millhorn Elder Law Planning Group located in The Villages, Florida today.